THE DICTATOR: Review- Baron Cohen’s Political Farce! This is a recurring joke in “The Dictator” where every time the Admiral General Aladeen (Sacha Baron Cohen) gets even the slightest bit annoyed with someone he motions to one of his guards with an off with their heads signal to kill them. It’s a funny sight gag when used appropriately, and after finding out all of his victims are alive and well, it serves to ram home the idea that Aladeen is a brutal and incompetent leader of the fictitious North African nation The Republic of Wadiya. Another long-running joke in the film is that General Aladeen not only took over his nation’s language, changing words like “positive” and “negative” to “Aladeen” but is also a star in many Wadiyan films such as “You’ve Got Mail Bomb”, and “Planet of the Rapes”. The film opens in a mockumentary style with news footage explaining the “nuclear threat in Wadiya” with the General Aladeen’s restriction to allow other countries to view his nuclear arms. We later learn that the 39-year-old “Supreme Leader” is working feverishly to build a massive missile, preferably with a “pointy tip”. His plan is soon placed on-hold when he is kidnapped during a visit to New York City. Forced to blend-in with American commoners, Aladeen turns his attention to re-establishing his identity and over-ruling the biggest threat of all to his dictatorship in Wadiya – a democratic government that will allow other countries to profit off of the Wadiyan oil. In “The Dictator” rarely are the jokes executed appropriately. And in a film where the plot is so basic, the comedy is really all we have to hold onto. This marking his fourth character parody film, Cohen has a solid supporting cast in Ben Kingsley who plays his back-stabbing right-hand man Tamir, John C. Reilly whose kidnap attempt goes array, Anna Faris as Aladeen’s grocery store boss, and even a comical cameo from comedian Gary Shandling as a Health Inspector. Other hysterical roles came from J.B. Smoove in an unforgettable funeral scene, and “MADtv” comedian Bobby Lee, as a Chinese United Nations Diplomat displaying questionable morals. Given its subject matter, “The Dictator” has the opportunity to provide scathing satire. Sadly, however, something the film never truly takes advantage of. The film never makes good use of Kingsley, even though Faris gives a solid performance. For argument’s sake, any competent actor could have taken on Kingsley’s role and done as fine a job. Aside from his role as the main facilitator of transforming Wadiya from a dictatorship to a democracy, his onscreen time is so limited, and his character so flat that his presence is almost unnoticeable. Enduring to the character of Aladeen is his obsession with pop-cultural and longing to be loved by everyone all the time. When they don’t, he beds enough celebrities to fill a wall covered with Polaroids of them. Like any dictator, he has an inflated sense of self. More important, though, the times when Cohen seems ready to inject his script with expert satire fizzle out into nothing more than frivolous “Family Guy”- style conversations and gags bordering on absurdity. Yes, “The Dictator” is a comedy and yes, from the outset it is made clear that the film does not take itself too seriously. But, this should not preclude it from giving us capable satire or even smart comedy. 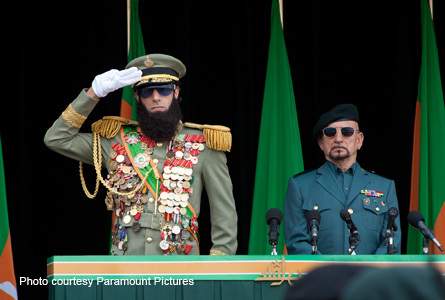 General Aladeen (L) with Tamir (Ben Kingsley). In one scene, Aladeen, down on his luck with no hope in sight, stands on the edge of a bridge, moments away from taking his own life. When his new ally and ex-head of his nuclear weapon department, Nadal comes over to convince him not to jump, the conversation heads into a them discussing the fact that Aladeen is wearing Crocs. It’s unfair to say this is inappropriate, but it is fair to say it is pointless. It’s an irrelevant, and from a plot standpoint, utterly unnecessary conversation in which the only conceivable purpose is to provide cheap laughs. And that’s really what “The Dictator” is: a series of gags and goofs designed, not so subtly, to illicit laughs every ten seconds. Often the film succeeds- when it’s funny, it’s funny- but more often it does not. As well, it could have been so much more. Where jokes are overused, there could have been restraint. Where dialogue seems forced and contrived, it could have been organic and free flowing. Where opportunities for satire are missed, they could have been better executed or even included. At the end of the film, Aladeen delivers a minute-long speech pointing out the differences between democracies and dictatorships. It’s an intelligent argument, but falls flat. It’s not in keeping with the tone of the film, and it comes out of a corner so alien that it’s almost unwelcome. Cohen’s first American film release “Borat” (before that, “Ali G” in the U.K.) was nothing more short of brilliant and given that his second, “Bruno” was disappointing, it’s unfortunate that he fails to right the ship this time around even after numerous test screenings in Los Angeles and Paramount Pictures delaying the film’s release date originally from May 11 to May 16. 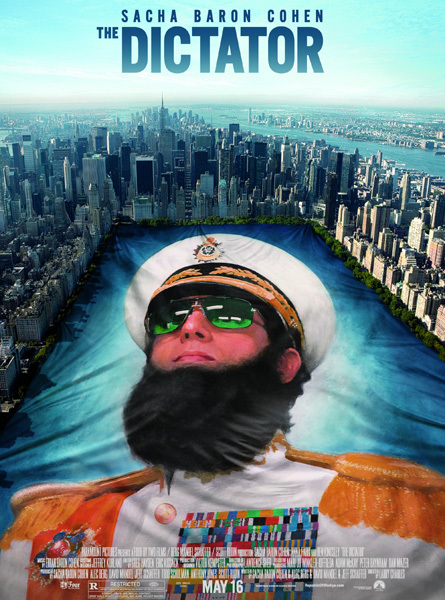 “The Dictator”, succeeds in providing some solid laughs and gags.